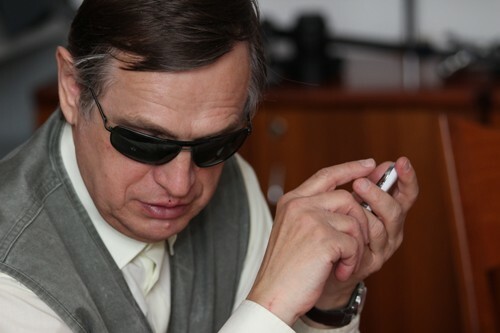 Why a blind must depend on a mechanical keyboard to use their phone if it is possible to use the touch screen of a smartphone in an intuitive way? BlindShell gives answer to that question and it is the first mobile with touch monitor suitable for the blind, designed by a team from the Czech Technical University in Prague (CVUT) and which will be released shortly to the market. This smartphone has an own design Android operating system and handles with four gestures accompanied by voice information. A short touch with a finger is used to move to the next menu of the screen, back by touching the left side of the screen and forward to touch the right. A long touch a finger confirms the choice and answering “yes”. A short touch with two fingers serves so that the mobile puts voice to the text of the screen or to check who is calling. And a long two – finger touch serves to cancel the election, answering “no” and in order to reach a higher level in the menu. All interactions accompanied by voice prompts so the user knows where in the menu of the mobile is located. “It is a solution not only for the blind, but also for those who do not have good motor skills and are unable to hit the correct button,” says Jan Simik, commercial director of BlindShell. “In general it is a phone aimed at the elderly, as people over 55 years”, says Simik. This device will provide cellular communications for 285 million people with serious vision problems are estimated to exist in the world, of which 39 million are completely blind. Global services division of the Taiwanese multinational Foxconn in the Czech Republic and BlindShell, an emerging company of the CVUT that for two years develops mobile solutions for blind people, will draw this new product to market at the end of June. For now Foxconn launch 3,000 devices, but even the price of the device has not been set. Two years ago released a first version of BlindShell, but now, there has been a significant qualitative leap, which “allows playing with the hardware in a completely simple way and according to the needs”, says Simik. The new device also incorporates features for blind persons such as internet radio, LibriVox audio books, social networking applications (Facebook and Whatsapp) and transportation guides. For those with more expertise, can also be a controlled transition of the environment designed to BlindShell to the Android. Other services that Foxconn and BlindShell want to develop for the blind people is color recognition and banknotes, access to electronic libraries worldwide and emails. “These are things to help them improve their daily lives”, he added, Daniel Novak, CEO of BlindShell.